Wood and stone floors are popular due to their natural beauty. However, these materials are difficult to source and require special maintenance, making them too costly for some households. 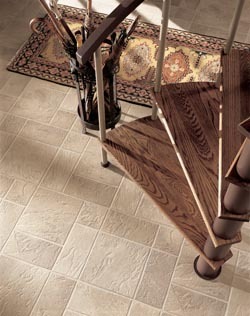 However, there is a way to bring home to the beauty of wood and stone without paying the high price: luxury vinyl. At Feasterville Floor, we’re proud to offer a wide selection of vinyl products. These surfaces mimic the appearance and texture of hardwood and tile--in fact, many are indistinguishable without close examination. When you’re shopping for luxury vinyl flooring in Feasterville, PA, visit our store to see your options in person and pick out the perfect surface to beautify your room. Nobody wants more chores to do--that’s why many busy homeowners choose vinyl. It’s built to last for years, withstands daily foot traffic, and doesn’t require any special care. All you need to do to keep your luxury vinyl floor looking great is basic sweeping or vacuuming, as well as occasional mopping. Luxury vinyl tile or plank floors are also a great choice for households with young children or pet. Why? These surfaces are water and stain resistant, so you can stress less about spills and accidents. Likewise, vinyl is ideal for any area of your house that may get wet, such as the kitchen, bathroom, entryway, or laundry room. Learn more about great applications for vinyl and get specific maintenance advice by talking to our staff today. Whether you choose luxury vinyl plank flooring or tile flooring, you’ll benefit greatly from professional installation. First and foremost, we handle all the hard work for you. There’s no need to devote a weekend--or longer--to trying to figure out how to put the pieces in place, nor is there any need to strain your back by being hunched over for hours. Our trained installers have all the right equipment and experience to get the job done right for you. Likewise, we work quickly. We understand that you want your room to be ready to use and show off as soon as possible, so our luxury vinyl tile installation and plank installation teams prioritize both speed and quality workmanship. Meanwhile, we also ensure all warranty standards are met so your new floor is fully protected. Reach out to our team today to discuss vinyl installation for your room. Contact us for further information on our broad range of luxury vinyl surfaces. We proudly serve clients from throughout Feasterville, Holland, Southampton, Warminster, Willow Grove, Levittown, Fairless Hills, Cheltenham, Ambler, Glenside, Yardley, Newtown, Morrisville, and Bristol, Pennsylvania.